Thank you to our members who took the time out of their busy schedules to gather at the State House for yesterday’s 14th annual Walk to the Hill. BBA members were among the 650 attorneys who put their advocacy skills into action in support of civil legal aid. Walk to the Hill 2013 was a great success, but our work to ensure adequate funding of civil legal aid is only just beginning. A real life example of how civil legal aid helps people was described by South Coastal Counties Legal Services client, Daniele Bien-Aime. Through no fault of her own, this mother of two young children lost her job, and then her health insurance and came close to being evicted from her apartment — while undergoing a bilateral mastectomy and follow-up treatment for breast cancer. A legal aid attorney helped her get her job back, continue her treatment and stay in her home. A surprise visit from Governor Patrick provided an opportunity for us to thank him for recognizing the importance of civil legal aid. 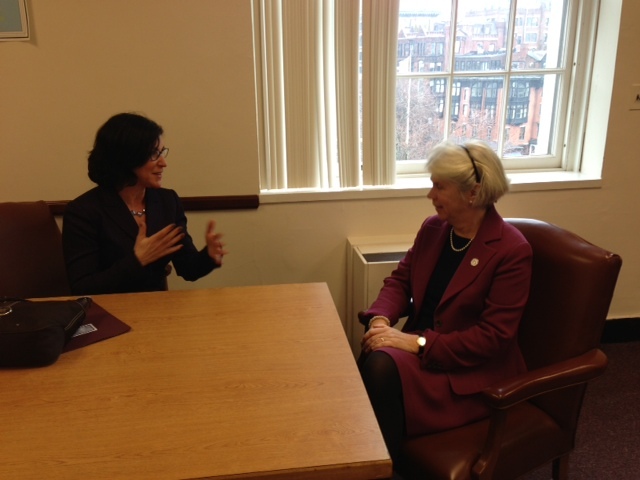 Last week, House 1 proposed $15.5 million for Massachusetts Legal Assistance Corporation (MLAC). The most important part of the morning followed the pep talks from Chief Justice Roderick Ireland, BBA President James D. Smeallie and others, when attendees headed toward the offices of their lawmakers to continue the conversation about the need for civil legal aid funding. As we described in Issue Spot before, making a personal connection and building a relationship with your own state senator and state representative is key to effective advocacy. Ellen Kief, a member of the BBA’s Solo & Small Firm Section and a resident of Weston, met with her legislators, Senator Michael Barrett and Representative Alice Hanlon Peisch. She shared her perspective on civil legal aid as a constituent and an attorney. In particular, Ellen emphasized her experience with immigration law and the positive impact that civil legal aid has had on her own clients. Meeting with a key staffer is just as important. As Issue Spot has said in earlier posts, staff often makes recommendations and it’s a great way to get to know what’s important to your legislator. BBA President J.D. 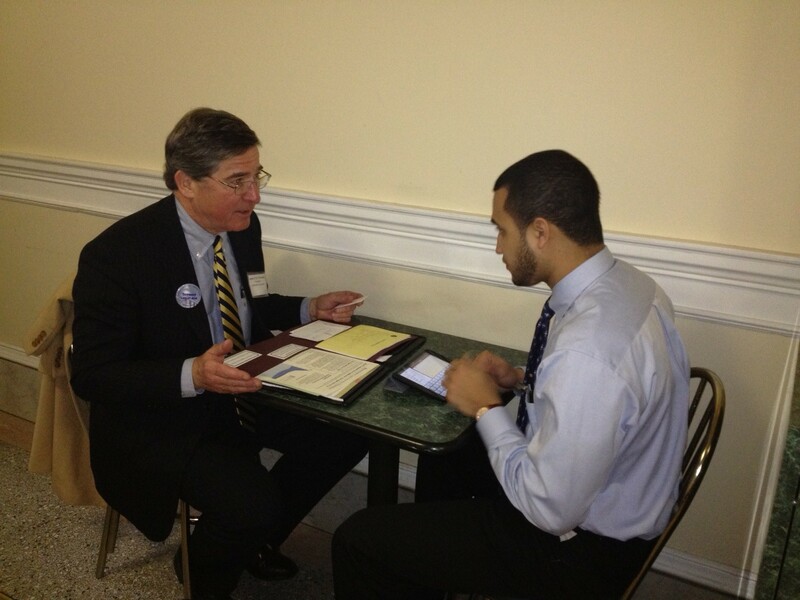 Smeallie sat down with an aide to his state representative, Jerald Parisella. This was an opportunity for President Smeallie to make a direct connection with the person who advises the lawmaker. It was great to see advocacy in action as lawyers filled the State House halls. These conversations will continue throughout the budget process that will run through the end of June. We need to cultivate these relationships and circle back to our legislators between now and June in order to provide them with additional information and facts, tell stories and keep the dialogue and discussions going. We need to arm them with the reasons why civil legal aid is important and should be one of their top budget priorities. House 1 – the governor’s budget proposal – has been released and the budget process has officially begun. Governor Patrick’s Fiscal Year 2014 budget proposal was filed yesterday, January 23rd with the House of Representatives. Governor Patrick has said that his budget focuses on investment in education, innovation and infrastructure. Along with these investments, the governor proposes a reduction of the state sales tax rate and various tax increases. The budget plays an integral role in how the entire justice system works –the amount of funding the justice system receives directly affects our state courts, our civil legal aid providers, the Committee for Public Counsel Services, and the District Attorneys’ Offices. As we’ve always said, adequate funding of the entire justice system in Massachusetts is essential to ensure equal and timely access to justice. Here is a quick review of what Governor Patrick proposed for the state judiciary and civil legal services. . .
We are so pleased that Governor Patrick appreciates the importance of civil legal aid for poor people and recommended $15.5 million for the Massachusetts Legal Assistance Corporation for Fiscal Year 2014. While this is a 28% increase over its FY13 appropriation of $12 million, this victory for civil legal services is so important because revenue from Interest on Lawyers Trust Accounts (IOLTA) continues to be so low. IOLTA, which had historically been the largest source of funding for civil legal aid, has dropped by 78% since 2008. Last year IOLTA revenue was $7.4 million and the total for this year is expected to be even lower. The Trial Court’s maintenance request for Fiscal Year 2014 is $589 million. A maintenance budget is the cost of maintaining current services in the next fiscal year. This takes into consideration adjustments for costs associated with inflation, caseload changes, and certain other factors. Governor Patrick’s budget includes $577.5 million for the Trial Court for Fiscal Year 2014. While this number is about $12 million less than requested, it represents a $16.5 million increase over the $561 million the Trial Court ultimately received in Fiscal Year 2013. What these numbers really mean for the Trial Court is still to be determined. We will proceed with caution as we work to convince the Legislature that the Trial Court needs more funding in order to deliver justice to all the people that access our courts. Governor Patrick’s budget proposal also creates a commission to study court re-alignment. The commission will include a representative of the BBA. This commission’s purpose will be to produce an independent, non-partisan assessment on the closure or re-alignment of courts. The House Ways and Means Committee will now review Governor Patrick’s budget and then develop its own recommendations by April. Stay tuned for updates as the process unfolds. Meeting with the people who make the important decisions is always a big part of any advocacy effort. This year we took it right to the top. BBA President-Elect Paul Dacier (EMC Corporation) sat down with Governor Patrick on January 9th to discuss court funding and specifically the Trial Court’s Fiscal Year 2014 maintenance request of $589 million and the $22 million needed for a judicial pay raise. The Governor was sympathetic and appreciated the BBA’s commitment to court advocacy. He also understands the need for fully functioning courts and agreed that our judges are woefully underpaid. In addition to meeting with the decision makers, we took our advocacy on the road to meet with those directly affected by the Trial Court’s budget. BBA President J.D. Smeallie hosted his own state representative and state senator at Salem District Court. This informal meeting also included the Essex County Legislative Caucus, Trial Court Administrator Harry Spence, clerks, judges and other court staff. This meeting offered an open forum to discuss the current state of the understaffed departments within the courthouse and what effect it has had on the administration of justice. Legislators that attended the meeting included Representatives John D. Keenan, Lori A. Ehrlich, Theodore C. Speliotis, Jerald A. Parisella and Senators Kathleen O’Connor Ives and Joan Lovely. Due to the success of this meeting and the impact of having court personnel speak on issues they face on a day to day basis, the BBA will continue to take court advocacy on the road by visiting other courthouses across the Commonwealth. We are co-sponsoring the 14th annual Walk to the Hill for Civil Legal Aid again this year. This event, one of the largest advocacy events of its kind will take place on January 30th at 11 am at the State House. Massachusetts Legal Assistance Corporation (MLAC), the largest funding source for civil legal aid programs in the Commonwealth, will be requesting $15.5 million for legal services, a $3.5 million increase over last year’s budget. This money is needed to avoid further layoffs and service cuts that would force programs to turn away even more residents who need legal help. 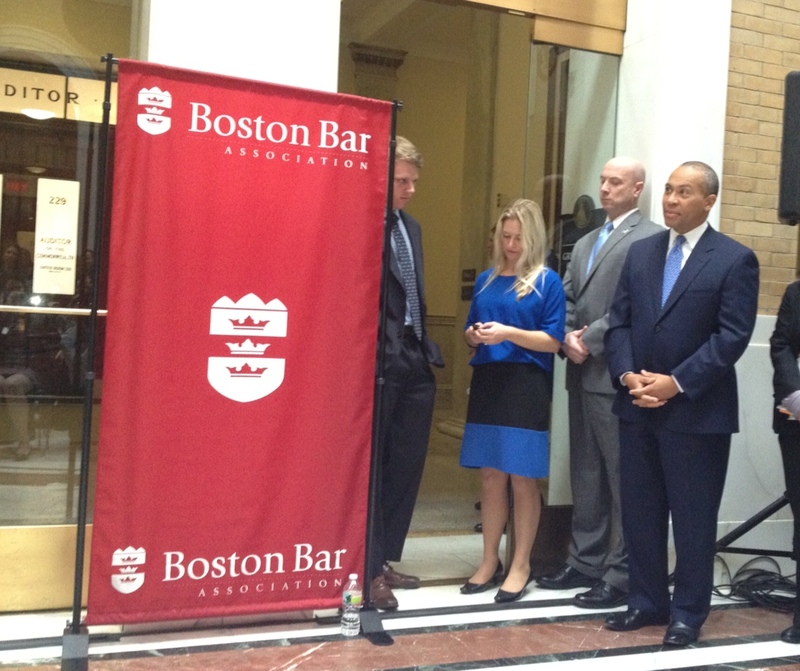 We also raise money for legal services through our charitable arm, the Boston Bar Foundation (BBF). In 2012, the BBF made grants totaling $1 million to 24 Massachusetts community organizations providing a wide variety of core legal services – from domestic violence and immigration to housing and homelessness. Each year the BBF hosts the John and Abigail Adams benefit to raise money to support is mission of promoting justice. The Adam’s Benefit will take place this year on Saturday, January 26 this year. Tickets are still available! The Boston Bar Association works year round on a variety of fronts to increase legal aid and secure funding for our Courts. We take serious our commitment to ensuring that all citizens of the Commonwealth have access to justice. The Equal Justice Coalition’s Walk to the Hill is coming up very soon – on January 30th at 11 a.m. at the Massachusetts State House. While this lobbying event – one of the largest of its kind — is an opportunity to socialize, network and get your picture taken with your law firm, Walk to the Hill needs to be more than that. It’s great that lawyers show up en masse for the speaking program – this year Chief Justice Ireland, BBA President J.D. Smeallie and a legal services client are among those that will speak to the need for more funding for civil legal services. But let’s remember that even more important is your visit with your legislator. More than ceremonial, these visits really matter. If you get to your representative or senator’s office and there is a long line of other lawyers waiting to deliver the same message, don’t be discouraged. Be encouraged! You live in a district full of people that care about this issue. But don’t assume that because there is a crowd your presence isn’t noticed – leave your name and business card with someone in the office with a note that you want the representative or senator to support legal aid. Numbers matter – the more people that leave their name, the better. If your legislator is not available, speak to a staff member. In most cases the staff person is often the one with the most knowledge on an issue. Legislative staff welcomes the input of constituents on issues. Staff members often act as gatekeepers and make recommendations or put issues on their boss’ radar. Winning over the staff member is one of the best ways to win over the representative or senator. If you learn your legislator does support funding for civil legal aid and you feel like you are preaching to the converted, take this opportunity to thank them for their continued support and ask them to do more. Ask the legislator to make funding for MLAC one of his or her top three budget priorities. If you sense that your legislator could use more information about civil legal aid programs, follow up with facts easily obtained from MLAC. Funding for civil legal aid has been severely cut in recent years while requests for legal assistance have escalated to unprecedented levels. If you’re a new lawyer, solo practitioner or part of a smaller firm, don’t be dissuaded from coming. Every year the BBA’s New Lawyer and Solo & Small Firm Sections meet as a group and head over to the State House together. Prepare yourself with the most up-to-date information from the Equal Justice Coalition using this fact sheet and review their suggested talking points. This will allow you to make your pitch quickly while hitting all of the key points. Walk to the Hill is more than just a symbolic showing of support for legal aid funding. It is a demonstration of the impact legal aid makes on peoples’ lives and the important role it plays in our communities. As important as the message is – legal aid is in crisis and the MLAC line item must be funded at $15.5 million for Fiscal Year 14 – personally delivering your message is even more important. This year we ask that you do more than show up – follow up with your representative and senator too. Relationships are everything when it comes to good advocacy work, regardless of which branch of government we’re dealing with. We need to have the right relationships, and we need to work on nurturing them. It’s actually easier than you think to develop these relationships and they begin with making a personal connection. On January 2, members of the House and Senate took their oaths of office and so began the 188th session of the Massachusetts General Court. As Issue Spot noted in a prior post, the Legislature has 19 new members. We should also mention recent changes in Governor Patrick’s administration as well. Several of Governor Patrick’s top people have left – including his Chief of Staff Mo Cowan, Executive Office of Public Safety Secretary Mary Beth Heffernan, and Administration and Finance Secretary Jay Gonzalez. These changes mean that we have new relationships to build and cultivate in both the legislative and executive branches. Building these relationships begins with personal visits that will take time and effort. However, there is no better way to shape the thinking of our policymakers than a personal visit. At the very least, a personal visit is an opportunity to introduce yourself as a constituent. Constituents – and not advocacy groups – elect law makers. And this is where the value of our membership comes into play. Every legislator knows that the best advocate is the individual who works or lives and votes in their legislative districts. Maintaining these relationships is equally important. Find occasions to connect with your legislator again. If you have useful information or insights, be sure to share that knowledge with your legislator. Eventually, you may even find lawmakers coming to you for information or your point of view. Back in October, we mentioned that BBA President J.D. Smeallie invited his state representative and senator to his local courthouse in Salem. This event will take place on Monday January 7th. An opportunity to highlight the good work that goes on in our state courts each day, this event is also a chance for the BBA president to get to better know his own state representative and state senator. This is just one of the many steps in our year round advocacy efforts on behalf of our state courts. On Valentine’s Day, the BBA, the Massachusetts Bar Association (MBA), and the Courts will again hold Court Advocacy Day at the State House. This event will feature remarks by BBA President J.D. Smeallie, MBA President Bob Holloway and members of the Judiciary. That event will help raise awareness about the judiciary’s budget needs on a larger scale. Consistent advocacy strengthens our positions. By continually developing our relationships, the BBA remains a trusted and valued resource. It is our responsibility to help our legislators and policymakers understand the judiciary’s critical role in ensuring access to justice for everyone in Massachusetts.